Our Ball and Chain with Shackle makes an impressive display. Great for museum displays, re-enactment use and living history events. 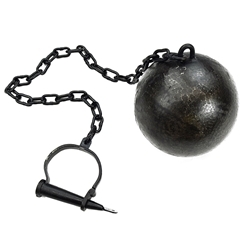 This ball and chain shackle has an iron ball and a blackened steel shackle and chain. The screw key is removable.